Documents at the Guatemalan National Police Archive (AHPN). Photo courtesy Archivo Histórico de la Policía Nacional, Guatemala. University of Texas Libraries Director Fred Heath traveled to Guatemala in December 2011 to participate in the launch of a joint project between the Guatemalan National Police Archive (AHPN) and The University of Texas at Austin. Together, AHPN and the Libraries would provide public access via the web to records of human rights violations by government agents that were discovered in a military munitions dump in 2004. This is Dr. Heath’s travelogue of his trip. Our flight to Guatemala City, 5,000 feet up in the Central American highlands took two and a half hours. Our destination was the National Police Archives, where on Friday we would celebrate with our colleagues, the recent opening of the AHPN website. I had yet to write my brief remarks. In the cramped rear coach seat of the Boeing 737, I held my laptop in my lap, with the screen tilted slightly forward to accommodate the encroaching seatback of the traveler in front of me, and edited my three-minute talk. I was working from the draft I delivered the week before, when we first opened the web site of the Guatemalan National Police Archive. Our next day — Friday, December 9 — would be International Human Rights Day, and AHPN director Gustavo Meoño had shrewdly decided to reciprocate the previous week’s events with a ceremony in Guatemala City celebrating the partnership between AHPN, administratively housed within the Ministry of Culture, and the University of Texas. 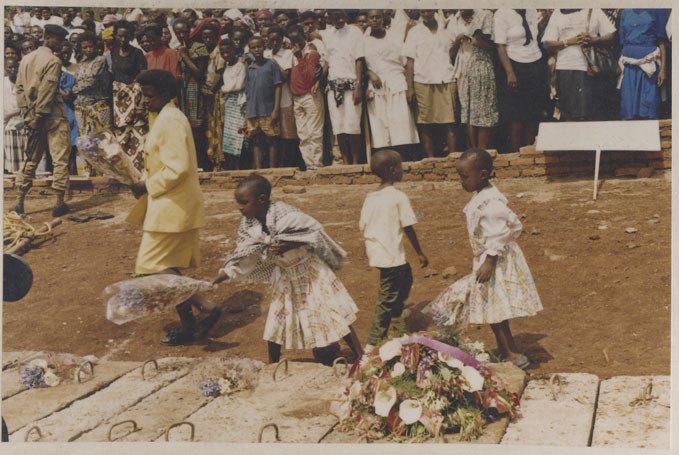 The Aegis Trust is one of eight organizations that have been awarded an EMC Heritage Trust Project grant through the company’s Information Heritage Initiative program for its work on the Genocide Archive of Rwanda. Aegis partnered with the Rwandan government and the Libraries’ Human Rights Documentation Initiative (HRDI) to build the framework for the Archive, the digital files of which reside with HRDI. The grant will provide for ongoing archival activities including the digitization and preservation of audiovisual testimonies, historical photographs, documents, newspapers and genocide victims’ information which is made available through the Archive’s site. Congratulations to the HRDI team for their continuing excellent work on this important project. It’s International Human Rights Day, and in the spirit of it, the Libraries can share news of its part in the opening of a new resource for the study of human rights. Thanks in large part to the generous philanthropy of the Bridgeway Foundation in Houston, the Libraries established the Human Rights Documentation Initiative (HRDI) in 2008, its initial charge to preserve digitally the records of human rights abuses in the Rwandan Genocide. Though HRDI’s mission has expanded in scope since that time – it has since established projects with the Free Burma Rangers and the Texas After Violence Project, and is currently negotiating new plans in Latin America – the project to collect, preserve and make accessible the Rwandan records has continued with itinerant staff constantly moving between Austin and Kigali, the site of the Kigali Memorial Centre where the fragile and sometimes anachronistic materials were being held. Today, the project reaches a milestone with the inauguration of the Genocide Archive of Rwanda, a new and comprehensive repository for information related to the genocide. The physical archive housed on-site at the at the Kigali Genocide Memorial facility in Kigali will contain the original audiovisual, documentary and photographic materials in a secure, controlled environment. The digital archive will eventually contain copies of all audiovisual recordings and scans of all known documents and photographs will be accessible to researchers through a cross-referenced system that allows key word searches, first on-site and ultimately online. The Kigali Genocide Memorial will maintain network infrastructure, servers, and digitization and storage equipment for the digital archive, and a copy will also reside with the University of Texas Libraries. Find more information about the project and the Libraries’ participation here. You can see a featured interview video from the Archive here. HRDI Archivist T-Kay Sangwand sat down for a reporter from National Public Radio’s Weekend Edition to talk about our role in the project. You can hear the interview and view some images from the Archive here. On March 10-11, 2010 the UT Libraries Human Rights Documentation Initiative (HRDI) hosted a visit from the USC Shoah Foundation Institute for Visual History and Education (SFI). The Fall/Winter edition of the Libraries Newsletter is now online. The issue features articles on the Texas Digital Library, some news on the Fine Arts Library‘s Sam Shepard collection, the Human Rights Documentation Initiative in Burma and on the web, the flowering of the Life Science Library‘s Science Study Break, and much more. And please take some time to peruse back issues while you’re at it.